A growing number of westerners want to work in India. Some years ago the only foreigners who found jobs in India were the “highly paid experts” from companies that had set up shop in India. But now middle-class foreigners are coming to India as well. India’s fast growing economy coupled with its growing shortage of people across industries has ensured the opportunities. But why should foreigners want to give up their comfortable life to want to come and work here, even if it is for a few years? They are trading a comfortable 9 to 5 existence with week-ends off with an alien place where people work long hours and in harsher conditions. So why do they do it? Update: A link to one of the articles in the story has sent by Joe, and this is the link. For the sheer adventure of it, the novelty or and the thrill…some like the idea that they can see cows or elephants on the road, others relish the diversity of India’s different states, which can be like being in “different countries.” Others, simply like the sounds and colours and Indian weddings! More challenges at work, the job is tougher but “dresses up’ the resume and gives great experience. As India is growing, it means the chances of meeting targets are higher, and offers a chance to showcase one’s ability. Can lead to career growth back home. A lack of a job or an opportunity to grow back home. Opportunities to do things which cannot be done (or cannot be afforded) in their own country…some buy second hand bikes and say they wouldn’t have beena able to in their own home country. Good restaurants and clubs are affordable here on a regular basis. Sure, their salaries in pure money terms may be lower than what they get in the west, but their pay packets go a longer way here due to various fringe benefits. They can get by with English, something that cannot be done in France or Italy or Spain. More leisure time as household help is available. So are drivers. Money is not the attraction as more money can be got back home although the foreigners do get various allowances like hardship allowances. But with free airfare to India and back, and often free accommodation and transport to the office, money can be saved. This money is usually spent on traveling within India. At times an ordinary job back home can be exchanged for a great one in India if there is a talent for something and one can find one’s niche. An Austrian I met is teaching at the Film and Television Institute of India in Pune. But even those with lesser qualifications can manage…there are instances of ordinary phone operators coming to India and taking jobs of high paying call centre operators/supervisors/trainers. And guess what, in certain cases the foreigners need not pay any taxes! This can happen if he/she works for a company which is doing business outside of India, for example someone who works in a call centre for a London based company would be exempted from taxes. There are other types of jobs which get them the tax holiday too, and you can read about ithere. Indian cities have large expatriate populations so expats are not lonely. They can meet up with people from back home and hang out with them. No one knows exactly how many foreigners are working in India today but their number is growing. 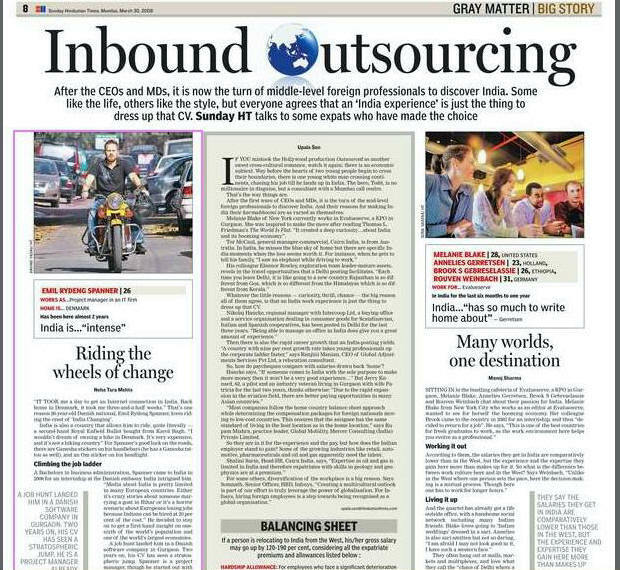 In fact if you take just the tech sector, and that too figures which are about 2 years old, it is believed that (by NASSCOM, National Association of Software & Services Companies) about 30,000 expats work here, and these figures have climbed three times from the previous two years. In the future, by 2010, India will need about 160,000 workers with “top-notch foreign-language skills” estimates Evalueserve, a Delhi-based research services company with a world-wide client base. India will only be able to meet a quarter of the demand and the company estimates that foreign workers will make up the shortfall. A need to be part of the India’s growth story. Publishing your brand or content has never been more easier as there are over 50 different social media websites you can utilize with vKonnect like Facebook, Twitter, Tumblr, LinkedIn and others.